Ronald Edwin "Ron" Gant (born March 2, 1965) is the current co-host of Good Day Atlanta on WAGA-TV from 4:30–10 A.M. and a former American Major League outfielder and second baseman earlier on who played for the Atlanta Braves (1987–1993), Cincinnati Reds (1995), St. Louis Cardinals (1996–1998), Philadelphia Phillies (1999–2000), Anaheim Angels (2000), Colorado Rockies (2001), Oakland Athletics (2001), San Diego Padres (2002), and again the Athletics briefly in 2003. He joined the 30–30 club (at least 30 stolen bases and at least 30 home runs in the same season) in 1990 and 1991 with the Braves. He is right-handed. 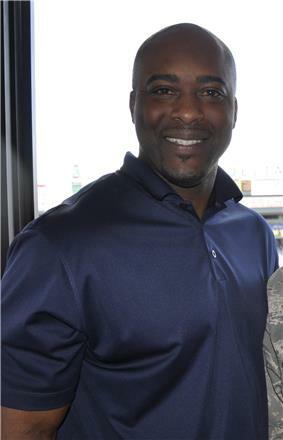 Gant was drafted by the Atlanta Braves in the 4th round of the 1983 MLB Draft (100th overall), and joined the Braves in 1987 as a September call-up. He collected 22 hits in 83 at bats, including two home runs. During the 1988 season, the rookie Gant was an everyday player for the struggling Braves, who finished with a record of 54–106. After a disappointing sophomore season in 1989 Gant was sent down to the minor leagues to learn how to play the outfield, Gant returned to form and the starting line up in 1990, when he batted .303 with 32 home runs and 84 RBI,and winning National League Comeback Player Of The Year. Additionally, Gant stole thirty-three (33) bases in 1990, qualifying for the 30–30 club. He duplicated that feat in 1991, joining Willie Mays (1956–1957) and Bobby Bonds (1977–1978 as the only players in Major League history to that point to have two 30 home run/30 stolen base seasons in a row. Barry Bonds later eclipsed the accomplishment, qualifying for the 30-30 Club in three straight seasons, from 1995–1997. Although his home run and stolen base totals were extremely similar the following year, most of his other stats were not as good: he hit just .251 with over 100 strike outs and 23 fewer hits in just 14 fewer at bats. His RBI numbers also increased to 105. The Braves lost to the Minnesota Twins in the 1991 World Series. Gant batted .267 in the series, with 4 RBIs, as the Twins won it in a close and exciting 7th game. During Game 2 of the 1991 World Series, Gant had a memorable and controversial confrontation with Twins first baseman Kent Hrbek. As Gant was trying to make it back to first base to avoid Twins pitcher Kevin Tapani's pickoff, he claimed Hrbek pulled his leg off the base during the swipe tag and Gant was called out. Drew Coble, the first base umpire, ruled that Gant's momentum would have carried him off the bag, and refused to change his call. Aiding the controversy the commentators at the time remarked that it appeared that Hrbek had in fact lifted Gant off the bag and that his 235 pound frame helped him lift the lighter Gant who weighs only 172 pounds. Also, New York Times writer Claire Smith wrote that "Hrbek seemed to lift Gant's leg right off the bag as the Braves' center fielder fought to keep his balance." This play caused the Braves bench to empty during the argument. Although he would never hit .300 again, Gant's batting average continued to climb back up into the .270s and his power numbers stayed great, while he continually drove in over 80 runs a year, peaking at 117 in 1993. In both 1991 and 1993, he was in the top 5 in the league in runs batted in. His speed and power combination made him a bidworthy item, and the Reds and Cardinals each paid a lot for him in the mid 90s. Before the 1992 season, Gant got into an altercation with future congressman Connie Mack IV. In 1992, Gant made his last World Series appearance, where he got 1 double in 8 at-bats, and the Braves lost again, this time in 6 games to the Toronto Blue Jays. On September 15, 1993 during a nationally televised game on ESPN against the Cincinnati Reds, Gant hit a game-winning walk-off home run off Rob Dibble to give the Braves a come from behind victory. The Braves trailed, 6–2, going into the bottom of the 9th. Shortly after signing one of the richest contracts in Braves history in 1994, Gant broke his right leg in an ATV accident. The Braves ended up releasing him; He wouldn't play again until 1995. 1997 was the low point of Gant's career, when he struck out 162 times and batted .229 for the Cardinals. After the Cardinals didn't play him full-time in 1998 (though he still hit 26 homers), he was traded by the Cardinals with Jeff Brantley and Cliff Politte to the Philadelphia Phillies for Ricky Bottalico and Garrett Stephenson on November 19. The next year, Gant would have his last real quality season. With the Phillies in 1999, he batted a solid .260 with 17 home runs and 77 RBIs. He had 13 stolen bases and 107 runs scored, with 27 doubles and 2 triples, in 134 hits. After a non-productive 2003 season with the A's, Gant retired at age 38. In a 16-season career, Gant batted .256 with 321 home runs and 1008 RBIs. He had 243 stolen bases and 1080 runs scored in 1832 games. Gant had 302 doubles and an even 50 triples in his career. He ended with 1651 hits in 6449 at-bats. Gant averaged 20 home runs, 63 RBIs, and 15 stolen bases a year. In postseason play, Gant was a .228 hitter with 8 home runs and 28 RBIs in 52 playoff games; he had 43 hits in 189 at-bats. During the 2005 Major League Baseball season, Gant worked as a color commentator for the Atlanta Braves on TBS. He currently works as an analyst on SportSouth during Braves games and on MLB Network. On October 25, 2012; he became a news anchor for the Atlanta Fox owned and operated station WAGA-TV, co-hosting the morning show Good Day Atlanta. ^ Smith, Claire (October 21, 1991). "BASEBALL; Who's On First? Not Gant". The New York Times.